It’s coming up soon. All you need to do is put it on your calendar, get dressed and show up with your dancing shoes on. It’s free! Once again, the Otsego Jazz Ensemble will provide the music, from 7pm to 10pm. 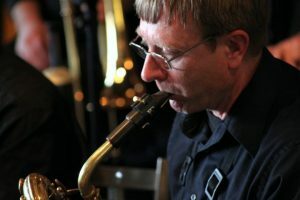 The band will play your favorite swing numbers from the Big Band Era, like Glenn Miller and Count Basie. Ian Brown will sing Sinatra favorites, and the band will feature special guest artist Lana Hoffman on vocals too. The theme for 2019, “Celebrate,” will feature red, white and blue accent colors. Going since 1988, The Senior Prom is an elegant and nostalgic evening of dancing and entertainment that bridges the generations between WMU students and Kalamazoo-area senior citizens. No reservations are necessary to attend this semi-formal event, which is free and open to the public. For general prom information, call Residence Life at (269) 387-4735. Specific questions may be directed via email to that office’s Bryan Austin at bryan.austin@wmich.edu. Parking: Suggested parking is the ramp east of the Student Center. Click here for map. If you’re looking for a place to kick up your heels this week, Otsego Jazz Ensemble, (OJE), would like to invite you to our regular rehearsal this Thursday at the Elks Club, 113 S Farmer Street in Otsego. It’s only $5.00 a person to dance from 7pm to 9:30pm. We take a break around 8:15 or so. Bring some friends! It’s a good chance for the band to work up some new dance tunes and get feedback from dancers and it’s a lot of fun. 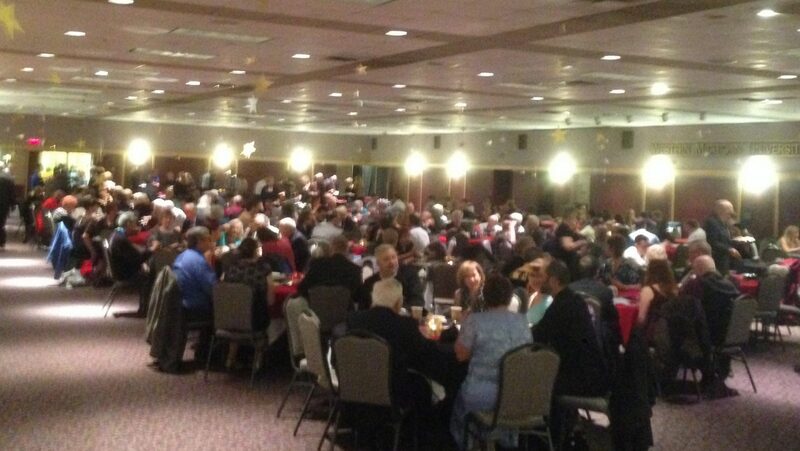 It also helps us pay our rent at the Elks Club! The Otsego Jazz Ensemble is proud to be a performer at the Thornapple Arts Council Jazz Festival again this year. The festival has been going strong now for 15 years in downtown Hastings, Michigan. And….there’ll be some surprises in store too, no doubt! Come out to the Festival for some great music Thursday thru Saturday at venues all around downtown Hastings and come out Saturday at 2pm to hear the OJE at Thornapple Plaza. 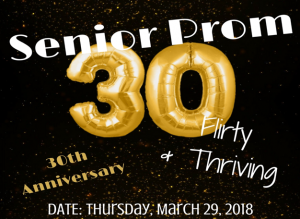 The WMU Senior Prom celebrates its 30th year on March 29th at the WMU Bernhard Student Center Ballroom. 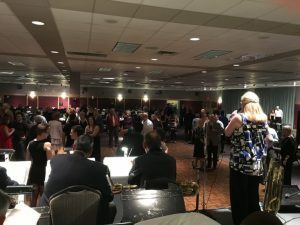 The Senior Prom began in 1988 as a way for older WMU alumni and area residents to share an evening of fun and reminisce with current students. The Senior Prom is organized by staff members in the Ernest Burnham-Smith Burnham and Henry residence halls with the help of volunteers. 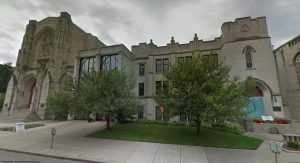 Financial assistance is provided by several WMU organizations, including the Residence Housing Association, various residence hall councils and the Residence Life office. The Otsego Jazz Ensemble is thrilled to be playing at the prom again this year. The theme this year is “30th Anniversary: Thirty, flirty, and thriving” with decorations mostly being pearls and lilies with black and gold as the colors. Bob Simonds 90th Birthday at the OJE Elks Club Rehearsal, 2018. Bob Simonds has been playing trumpet for a long time, and at the age of 90, he’s still going strong. 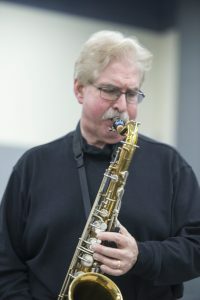 Bob played many a gig in Kalamazoo as a member of the premier band in the area, The Bobby Davidson Orchestra. Bobby’s band played a lot of proms and every other kind of gig in the 50’s, 60’s 70’s and 80’s. Davidson, a drummer, also started the first Jazz Band at WMU back in the 60’s. 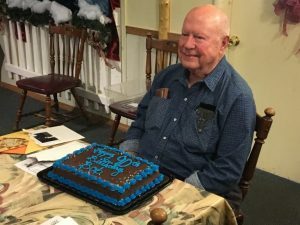 Bob, still a fine soloist, has been a member of OJE for several years now, and recently celebrated his 90th birthday at an OJE Thursday night rehearsal at the Otsego Elks Club. 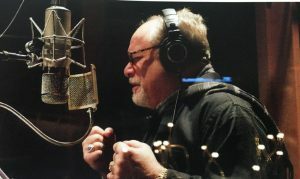 Many area musicians owe a great deal to our old mentor and friend, Bobby Davidson, who is no longer with us. We’re very fortunate to have his old friend Bob Simonds in the band to fill that void.